Do you have a dog who you suspect has canine arthritis? Osteoarthritis in dogs can cause chronic pain at any age & typically increases as your dog ages. Signs of canine arthritis symptoms can include: slow at getting up & moving, lack of muscle tone, hunching over, snappy when being handled, groomed or pet, constant licking or chewing, limping or dogs that tire easily. It is important for the well-being of your dog to recognize these sometimes subtle symptoms of arthritis & start a treatment plan right away. Starting a good treatment plan for dog arthritis can slow down the progression of disease & lead to a better quality of life. Canine arthritis treatments can include such things as acupuncture, laser therapy, physical therapy, diet, exercise, prescription drug treatments & more natural healthy joint supplements. For as long as I can remember Dexter The Dog has been on Duralactin Canine Chew. Why you may be asking. 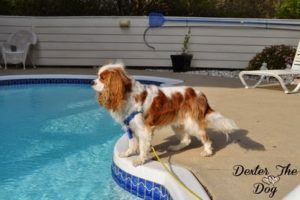 Cavalier King Charles Spaniels have a tendency to have luxating patellas. As a prevention, our veterinarians (2) recommended Duralactin. Duralactin is a supplement made from dried milk protein from hyperimmunized cows. So let’s look at what hyperimmunized cows means in our case. Laboratory studies have determined that cows who have had the polyvalent bacterial vaccine produce milk capable of anti-inflammatory agents. Second, clinical studies show no difference in the safety outcome between cows hyperimmunized cows & non-hyperimmunized cows. So far, so good! Since Duralactin Canine has little side effects (some dogs may be sensitive at first to the milk protein), I felt it was a safe & healthy way to work on preventing bone & joint disease. If you have a dog breed who is prone to arthritis & joint pain, Labrador retrievers, German shepherd dogs, golden retrievers come to mind, you might what to ask your veterinarian about Duralactin as a prevention. Also, check out our post on Fatty Acid supplements.